The archetype of Halloween monsters, Frankentein's monster is positevely royal in the world of Halloween. This decor piece has the monster in his classic green skin. Black, ungroomed hair is atop his head, exposing the stitched that line his brow. 2 more stitched cuts are located on his forehead and cheekbone. Sunken eyes and a slight grin give a softer take on Frankenstein. The iconic neck bolts are protruding and highly visible. 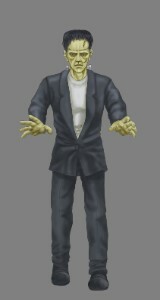 Donned in an off-black suit and white crew shirt, Frankenstein's appearance is detailed and resembles the world-famous monster.